Arsenal can win FA Cup easily now as their star player are close in returning from their respective injuries. Ramsey, Ozil, Wilshere and Diaby all set to return. Arsenal trio Jack Wilshere, Aaron Ramsey and Abou Diaby all are close to be back in action once again after recovering from their respective injuries. 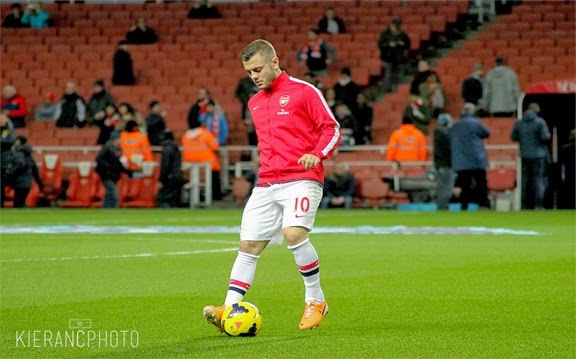 Daily Mail reported that Jack Wilshere has taken a step closer and will be returning soon. The 22-year-old suffered a hairline fracture to his left foot during a friendly match against Denmark in the start of March. The Englishman wants to return as early as possible so that he can boost his chances to get a place in England squad before the coming World Cup in June. While Aaron Ramsey who started the season very well suffered a thigh injury against West Ham in December. According to reports he might be back in action for Arsenal against Wigan in a FA Cup semi final on 12th April. Ramsey scored 8 goals in 18 games for Arsenal before sustaining the thigh problem. The absence of Ramsey might be the reason of Arsenal current position in the Premier League table. While it is also reported that Mesut Ozil could be on his way for the semi final. Also, Abou Diaby who has not played any game for Arsenal this season is set to return from his long term injury tomorrow. FA Cup looks brighter for the Gunners.